You’ll never walk alone …. If somebody said to me 2 years ago that one day you could run a marathon, I would have probably just laughed at them. Well, it turns out that I actually could run a marathon; in fact, anybody could, providing you put in the hard work. Last year, my wife ran the half marathon at Liverpool Rock n Roll, in fact, it was her first HM, and she absolutely loved it. I was told how the bands on the route were brilliant, how the atmosphere created by the runners and watching supporters was second to none (she hasn’t done GNR yet), and that the whole weekend, in general, was amazing. So given her feedback, how could I say “No”. After all, it was only the HM I was saying “Yes” to. That was until fellow Strider, Chris Edwards, stuck is oar in and tried to persuade me to join him in the marathon instead. 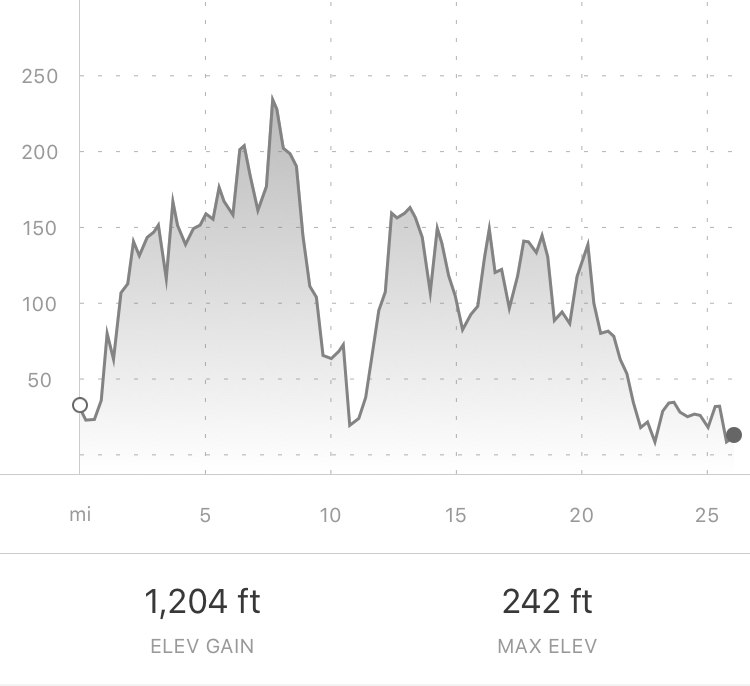 After reviewing each run’s route, it didn’t take me too long to make a decision. 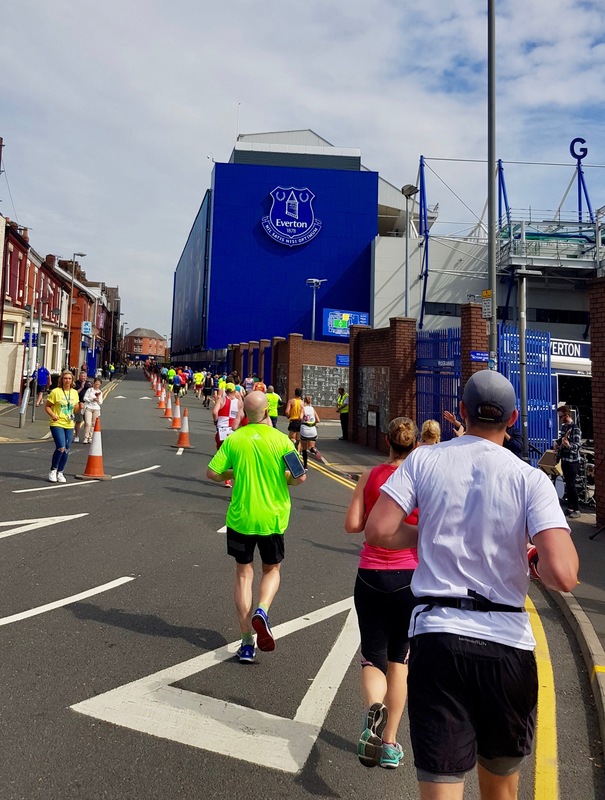 The deciding factor being that the marathon goes by Goodison Park, the home of Everton, my childhood football team, as well as Anfield, a place where the other guys play. This might not make sense to many of you but as a massive football fan, this was very much the overriding factor. 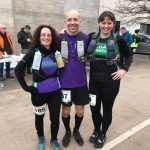 Given this was to be my first marathon and having an obsession to have things planned and organised, I wanted to ensure that I had all bases covered before I started; a trusted training plan, knowledge of race nutrition, setting of race goals and strategies. 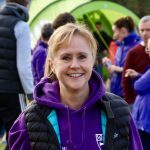 I called upon Anna Seeley to help produce a first timer’s training plan. Anna helped customise the plan to fit in with life’s busy schedule, which worked out perfectly. I also spoke with many others within the Club and asked them about their first time experiences (that doesn’t sound right, does it? ), seeking advice about training and/or race nutrition. I knew that I had to set myself some target times, ones that were clearly stretching myself but equally achievable. I also set myself a target of losing some weight, much of which would come naturally as part of the increased training, but supported by a healthier and more balanced diet. From start to finish of the training plan, I lost approximately 1.5 stone, not quite target but very close to it (fingers crossed it stays away). 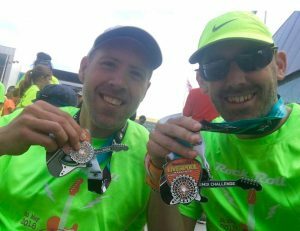 After 16 weeks of training, a period in which I saw many of my running/training buddies complete their training and run their own marathons before my own, I knew I was finally ready to give it a shot. I had worked hard for this race and I knew it was too late now to let myself down or anybody else. This was it…. The day before the big one I ran the Rock n Roll 5k run. This was purposely planned for 2 reasons; firstly, a nice gentle warm up to keep the legs warm and secondly, you get an extra ‘Remix’ medal for running on both days. It’s all about the bling, for some ☺. The remainder of the day was spent sightseeing in the city centre. The sun was out which encouraged the crowds into town, creating a wonderful, vibrant atmosphere amongst the locals and visitors. Liverpool is such a beautiful city, one that has undergone so much regeneration and change over the years. 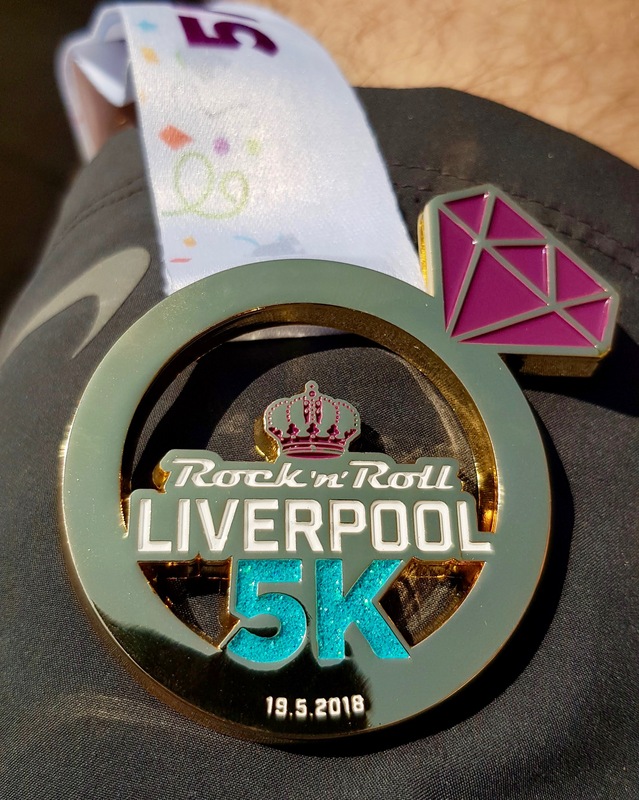 If you’re not going to run this race or an equivalent Liverpool race then I would definitely recommend paying the city a visit at some point. I didn’t think I would be nervous but I was. It was difficult to pinpoint why I was nervous because I had been excited and fairly confident in the run-up. All my kit had been prepped and set out the night before, so no worries there, however, I had to lacquer a couple of gallon of sun cream over myself. Maybe a slight exaggeration, but the forecast said it was to be hot, just like the previous day, so sun cream was a necessity. We made our way to the starting line, just a shortish walk from our hotel, cheering on the HM runners who had just started. As predicted, it was warm but thankfully there was some welcomed cloud cover. A short warm-up lightened the nerves before we took our place in the corral (never heard this before, must be an American thing). Finally, we got to the starting line, the hooter went and we were underway by which point the nerves had gone. The route initially led us around the docks (BTW, Fred’s weather map has gone) and the Liver building before leading up and out of town towards the Everton area. The crowds along the way were out in good numbers and very supportive, and the bands were loud, just enough to drown out my terrible singing. I felt that the pace was comfortable and I was on target as per my plan, and for now, there was no sign of the heat affecting me. It wasn’t long before Goodison Park was on the horizon (about 4 miles in). I’m not one for taking photos whilst running, in fact, I don’t usually take a phone with me at all, but as mentioned this was the main reason I decided on the marathon rather than the half. I managed to take a pic or 2 at Goodison whilst trying not to lose focus on my run and pace. The route made its way across Stanley Park towards Anfield where once again I tried desperately not to let it distract me. Just before Anfield, I reached the 10k timing point and a quick glance at my watch displayed 55:02 mins, just under 9 min/mile pace, so I was still on plan. For the first time in the race’s history, the organisers had an agreement with Liverpool FC for the route to run through the concourse of the famous Kop end. 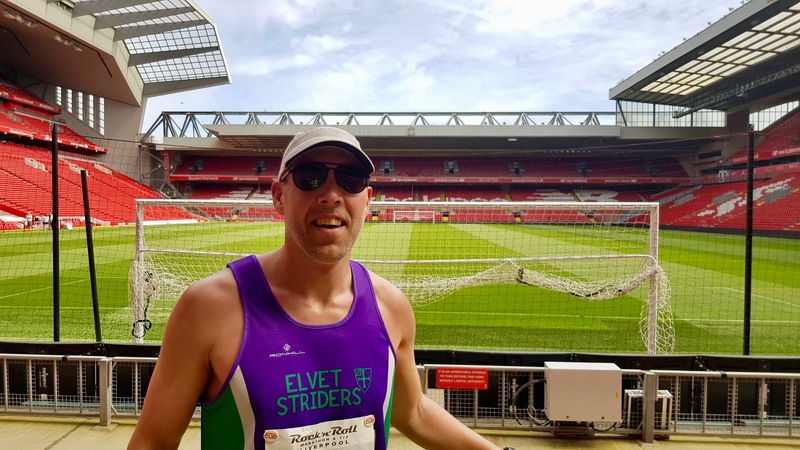 Crazy as it might seem, being a Toffee fan (that’s Everton’s nickname for those who don’t know), this was actually my 2nd biggest highlight of the race. As I ran through the concourse I noticed there was a lit up opening, which led to the stand looking out towards the pitch, I just couldn’t miss out on this opportunity (sod the time, well it took all of 20 secs, just kind of wish I had more time to admire it the stadium and the pitch). To top it off, as the run made its way out of Anfield, there was a band playing ‘Mr Brightside’, the best song EVER. The hairs on my arms were certainly standing up at that point. Gradually the route rose to its highest point at about 7.5 miles in, a point, which provided wonderful views over the City Centre, although it wasn’t the nicest of areas of Liverpool. Pace and timings were still good as we made our way towards the city centre, through China Town and then up the hill (some bloody hill) towards Sefton Park. 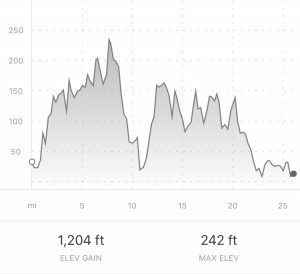 I hit the halfway point at 13.1 miles in 1:58:08, so I was now spot on 9 min/miles with the big hill out of the way, or so I thought. It turns out there was a series of hills, one after another, but thankfully they were among some beautiful parks and areas including the famous ‘Penny Lane’ – I didn’t see any ‘fireman with an hourglass’, however, it was definitely at that point that the ‘Blue Suburban Skies’ appeared. It was suddenly like ‘here comes the sun’ but without the words or music. The heat soon turned up a notch. I was in need of a quick pit stop before hitting the next park, I’m not just sure if doing so took its toll on me, but I slowed down somewhat after this point: most probably a mixture of sun and stopping for a wee break. I finally reached the 20-mile point before hitting the long stretch along the river towards the finish. It was at this point cramp kicked in, not just one calf, but also both calves and both quads. I was like a zombie at some points, absolutely excruciating pain, unlike anything I had ever felt before. Unfortunately, I knew my race target and goal was over at this point, it was just a case of making sure I got to the end and completed the race, however necessary. I was warned before the race that the last 5 miles weren’t the most exciting and it certainly lived up to those comments. There were a few bands spaced out along the path but nothing that gave me the boost I so dearly needed. The sun was still beating down which obviously didn’t help, so you could say I wasn’t feeling particularly happy at this point; however, I persevered and continued to run/walk through the pain. My pace dropped considerably to about 11-11.30 min/miles but I was focused on just getting to the end regardless. I wasn’t the only one suffering, many others looked to be in a similar situation, but collectively we pulled each other along which coincidentally made me think of the Liverpool’s famous anthem “You’ll never walk alone”. As I approached the last 500 meters, I heard the usual shouts of “the finish line is just around the corner”, and there’s me thinking it is but plus another lap of a track. I kept it going as much as I could but I felt I wouldn’t have the usual sprint finish within me. 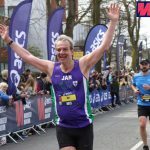 I honestly felt destroyed but with 200 meters to go, I heard a series of shouts from the crowd, recognisable voices too, and as I glanced over I saw Rachel Toth and Jacqui Robson cheering me on. I then felt a euphoric feeling as the crowd pulled me in and thrust me towards the finish line. I did it, yes, I bloody did it. I finished in a time of 4:16:31. This was the definite highlight of the race. Completion! The sense of achievement was and still is unbelievable. I had genuine tears in my eyes as I crossed the line, instantaneously realising exactly what I had just achieved. It was nothing short of remarkable (for me that is), something that I’ll always remember, but at the time thought ‘never again’. In summary, I wouldn’t say I loved it, nor did I hate it. There are plenty of pros and cons of the race itself. 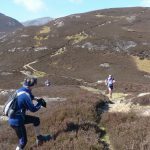 I would definitely recommend it to folk who fancy a hilly road marathon with some fantastic views and parks to run through whilst being provided with great support and excellent live bands for most of the route. It’s not the best sort of race for those who detest the commercial type runs. The goody bag contents were ok; however, I say ‘goody bag’, there was no actual bag, so you literally had to carry everything. Not great at the end of a marathon when you just want to collapse. Signage and directions need to be worked upon by the organisers, as it took a while to figure out where to collect my shirt from, but I certainly knew where to find my free beer. 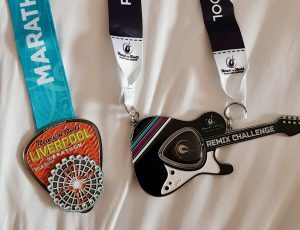 The medals are fantastic, 3 for the price of 2, providing you run both days. Having said all this, I personally don’t believe I would do this race again, but another marathon, who knows??? I’ve already changed my tune in the few days since the run. There are definitely lessons to be learned on a personal level but I guess all this comes with experience. Lastly, many thanks to all who supported me, sending best wishes and congratulation messages, however, special thanks goes to Anna Seeley, Allan Seheult, Lesley Hamill, Peter Hart, David Browbank & Chris Edwards. You all played different parts in the process and I’m very grateful for everything.